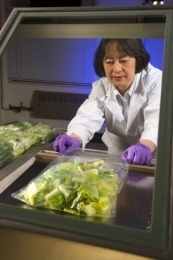 Yaguang Luo - Yaguang Luo, Ph.D.
Dr. Luo spent six years working on food safety and process improvement in the fresh-cut produce industry. In 2001 she moved to USDA where she has continued to work intensively on the safety of fresh-cut produce. "It was the individual more than anything which made her research stand out," recalls Dr. Max E. Patterson, a retired specialist from Washington State University and Dr. Luo's major advisor. "Her work ethic was remarkable and her analysis and interpretation of analysis was 100% reliable." CPS student staffer Alyson A. Barnes spoke to Dr. Luo recently about her work. Can you tell me about how you got started in the industry? About three years after my postdoc I felt ready for a more permenant position. Since I was a member of both the post-harvest and food science departments, each team perhaps felt I was more aligned with the other. Dole Fresh Vegetables created a position which merged the two disciplines, and I found myself in the fresh-cut industry. I later joined Fresh Express where I eventually became research leader in charge of process improvement and food safety support. Six years in the fresh-cut industry taught me how to work effectively with cross-functional groups, communicate scientific issues to people of various backgrounds, and multi-task under short timelines. But most importantly, it helped me understand the safety issues facing the industry—across the entire supply chain—and the technologies and practices involved in the growing, harvesting, and fresh-cut processing of leafy greens, tomatoes, and other produce commodities. Then how did you end up at USDA/ARS? I really enjoyed working with Dole and Fresh Express; it was a difficult decision for me to leave the industry. However, I always had a passion for public service, and wanted to be able to write publications and conduct more fundamental research studies. I am grateful for the experience the industry gave me, but in my heart I knew I wanted to work for a broader public good. How did you learn about the Center for Produce Safety? What about the recent RFP led you to apply for funding? Having worked closely with the produce industry, I was aware of the formation of CPS from the beginning. I was so pleased to see that major players in the industry donated money to fund CPS. I believe that the research topics proposed by CPS touch on the core produce safety challenges facing the industry today. I also like the format of the CPS RFP because it addresses pertinent issues and provides background information on those issues, and because most of the topics are mission driven. I am passionate about developing practical and cost-effective solutions to the real life problem, so I found a nice match between my research programs and the CPS mission. CPS awarded funding to your project “Minimizing pathogen transference during lettuce harvesting by optimizing the design of the harvesting device and operation practices.” What do you think are the key factors influencing this field of inquiry? Food-borne illness outbreaks associated with produce are very costly to industry and shake consumer confidence in products that are otherwise beneficial for health. The need to address food safety issues is recognized, and recommendations to improve produce safety are made, but without sufficient scientific data. It is important to completely understand the issues and have substantial scientific data to be able to make the best recommendations to industry to solve problems effectively and restore consumer confidence in fresh and fresh-cut produce. This multi-disciplined project aims to provide scientific data obtained under real-world conditions to assist the industry in performing risk assessment of lettuce-field coring practices. Strategies and approaches identified could facilitate immediate and near-term improvements in field coring and harvesting operations to reduce potential risks from pathogen contamination and transfer to product. Optimized design of the coring knives to help minimize pathogen contamination cost effectively, and the development of novel ultrasound technology for knife disinfection, together may provide needed tools for harvesters to enhance the effectiveness of coring-knife sanitizing procedures. Where do you see the field of food safety research five years from now? Since 2006, produce safety research has jumped to the top priority in the food safely research arena. I hope that five years down the road the intensive research studies we are conducting today will lead to practical solutions to some of the major safety issues. Personally, I still believe that developing an effective kill step while maintaining quality and shelf-life is the key to success, especially for fresh-cut produce. It is extremely challenging, but not impossible. I have been blessed with the opportunity to work with an excellent support staff, and they take care of the majority of the laboratory work. I spend quite a lot of time writing publications, reviewing manuscripts and grant proposals, organizing scientific meetings, and interacting with stake holders, co-workers, and collaborators. Outside of work, I like to play table tennis and swim. Finally, what would you consider a career highlight? I would say receiving the grant award from CPS is one of my career highlights. It is very gratifying to me to receive funding for this project. I understand that the lettuce field coring practice provides substantial economic savings to the industry over the traditional harvesting practice, and I am eager to work with the industry to improve the food safety aspects of this practice.